choir croak out them goodies: Crap to do on a Thursday. Crap to do on a Thursday. 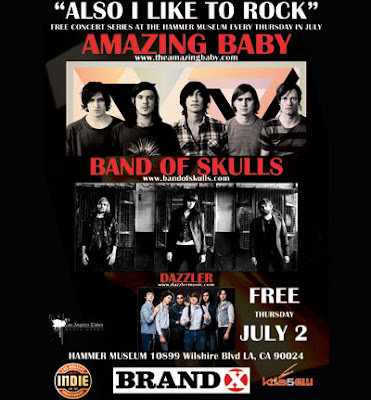 The Also I Like to Rock concert series is returning to the Hammer Museum for the summer! Yes, technically the above is available in full on You Tube, but watching movies in ten minute segments just isn't any fun. As an alternate option, tomorrow (July 2), Libros Revolucion/Revolution Books in downtown L.A. is showing this, The Pleasure of Finding Things Out, a 1981 BBC interview with physicist Richard Feynman. It's a bit dry for the impatient, but he's a jolly one-way chat, and gives a good lesson on human perspective and education. This should be a worthwhile viewing, and will be followed with a discussion led by optical physicist Taylor Trowbridge. In preparation: Check out Feynman's Nobel lecture from 1965. Don't forget about the Black Math Horseman show tonight at Silverlake Lounge! Okay they're playing at midnight so technically it's on Friday, but try not to be a little twit about it, okay? To be fair, I'll see Black Math Horseman if you go join that physics discussion at the commie bookshop.